GUYS. THIS WAS A NEWBORN PUPPY SESSION. How am I this lucky to have a job where I can photograph puppies?! When my upcoming wedding client, Megan, messaged me asking about doing this session, I pretty much responded "I'll be there in 10 minutes." I mean, for real. 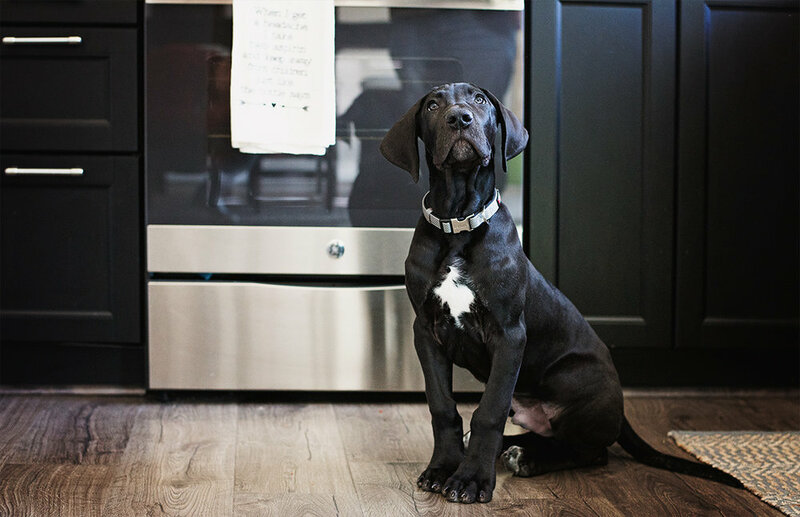 Great Danes have always been a breed of dog that my heart was just drawn too. As puppies they are so awkward and don't really know what to do with themselves. As they get older they start to really get a hang on life and what that means for them. 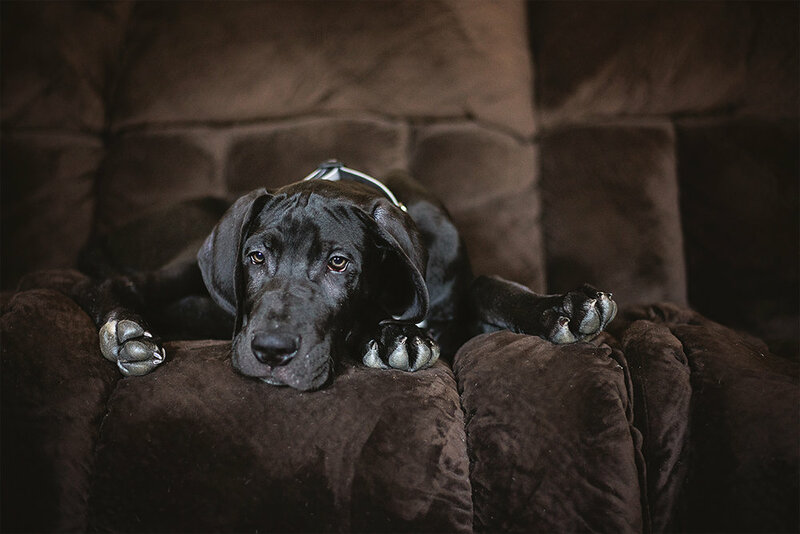 For a Great Dane it means having your own couch, lifted food bowls and a heck of a lot of attention. This little big guy has such a sweet demeanor. He's shy at first but eventually curiosity takes over and he lets loose. I have to hand it to Megan and Justin though, getting a puppy a week and a half before your wedding is fairly insane- but go big or go home. You'll have such a sweet face waiting for you both when you get back. So what was the most important thing to document in a session like this? Honestly- his size. I made sure to photograph him in parts of the house that were mot likely to change. I wanted Megan and Justin to be able to have him sit in front of the stove in 8 months (when he is likely much taller than the stove) and hold this picture up and compare. I tried to approach it the same way as a newborn shoot- the details, the smallness, the curiosity and playfulness in his face. Soon enough, his legs wont seem so long, he will be the size of a horse, and his playfulness will turn into a stoic and loving expression. But for now, he's a little big puppy, and I just feel so DAMN LUCKY to not only cross this shoot of my bucket list, but to be in a job that so easily combines everything I love. There are so many more amazing posts in the works coming up so keep checking back! But I will leave you with just 1 more puppy shot, because..... well, because I can.